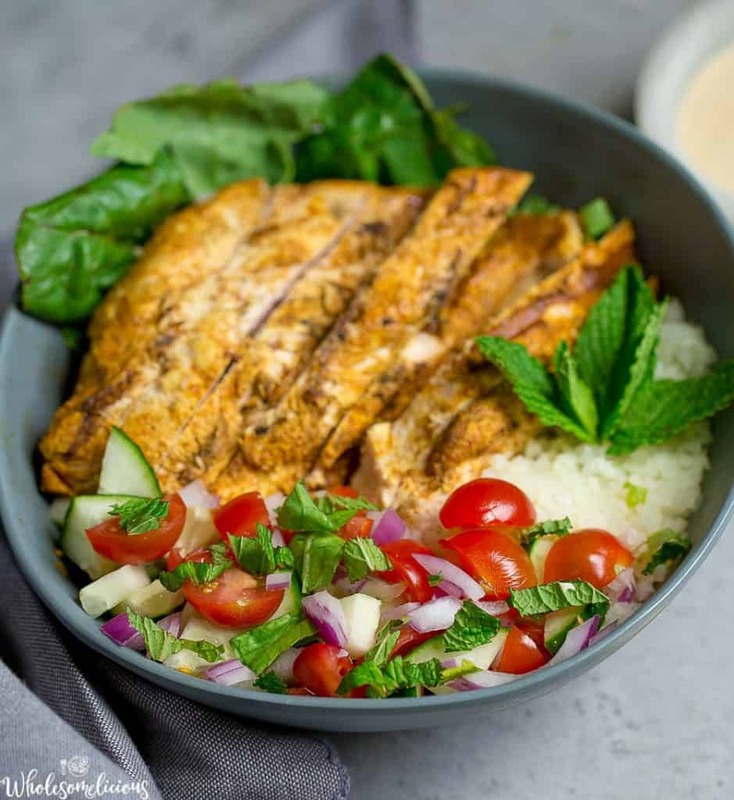 Grilled Chicken Shawarma Bowls are where delicious Middle Eastern flavors meet for a simple high five during a warm spring or summer evening. A simple marinade for the chicken, refreshing toppings, and the most delicious tahini dressing make for a fantastic outdoor meal! Meal prep the chicken and dressing on the weekend for simple lunches and meals throughout the week. 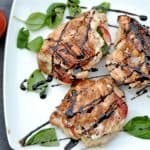 Chicken Shawarma might be one of the most versatile and easy meals to make. Like me, you may be one of those giddy with excitement anytime your tastebuds get to experience a bowl of deliciously fresh Middle Eastern food: tabbouleh, hummus, baba ganoush, tomatoes and mint, the list could go on! I’ll never forget my one day adventure touring Jerusalem, and having a bowl of All The Things to include the foods listed above, falafel, and even warm pita bread. Heaven!!!! So when I want to go back to memory lane, and transport to this lovely place on Earth, I grill some chicken shawarma. While chicken shawarma is generally made on a spit (sometimes for up to 24 hours), I realize this is not an option for many of us. The grill works perfectly in this situation. 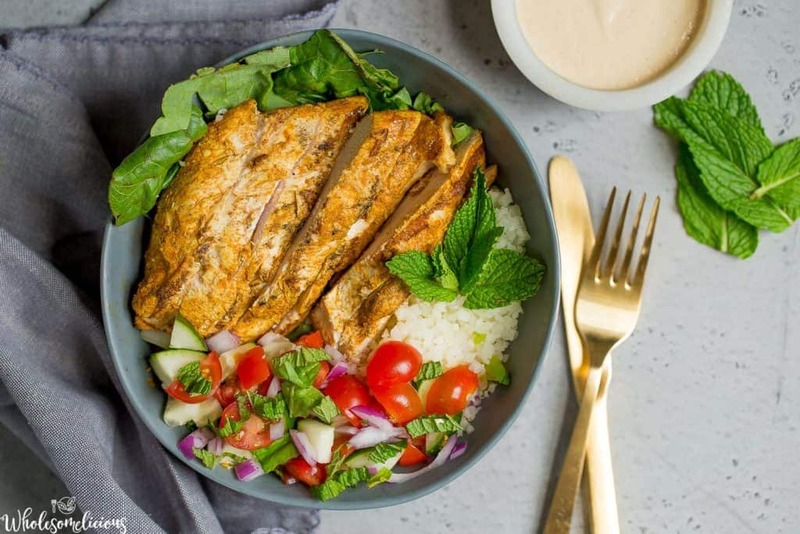 The marinade contains traditional shawarma spices: cumin, smoked paprika, coriander, and cardamom. Adjust your cayenne pepper to the spice level you like. The zesty lemon and garlic bring out the flavor for a bold taste! These days, me and pita bread aren’t exactly friends. So instead of using pita as a gateway for all the goodies in my mouth, the bowl option is my preferred choice! I’ve layered this bowl with romaine lettuce, cauliflower rice, tomatoes, cucumbers, onion, mint and the a delicious tahini dressing. 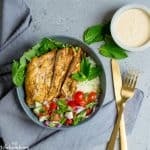 The tahini dressing is one that I keep on hand for salads, and works as a hummus replacement for these yummy bowls! 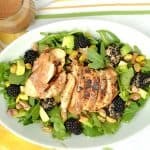 I love that the dressing and chicken can be me ahead on the weekends, and then enjoyed throughout the week for lunches. 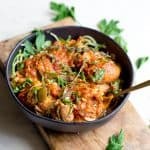 Such a great meal prep dish! Begin by making your marinade: whisk together oil, lemon juice, spices, and garlic in a medium size bowl. Pour marinade into a large container with the chicken, and mix until chicken is well coated. 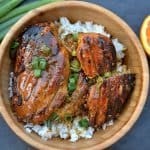 Marinade for at least 1 hour, up to 24 hours. 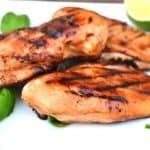 When ready to grill, place chicken on prepared grill and cook for 4-5 minutes. Flip the chicken over, basting with any extra marinade, cooking until chicken is no longer pink (about another 5 minutes). Remove and cover with foil until ready to eat. 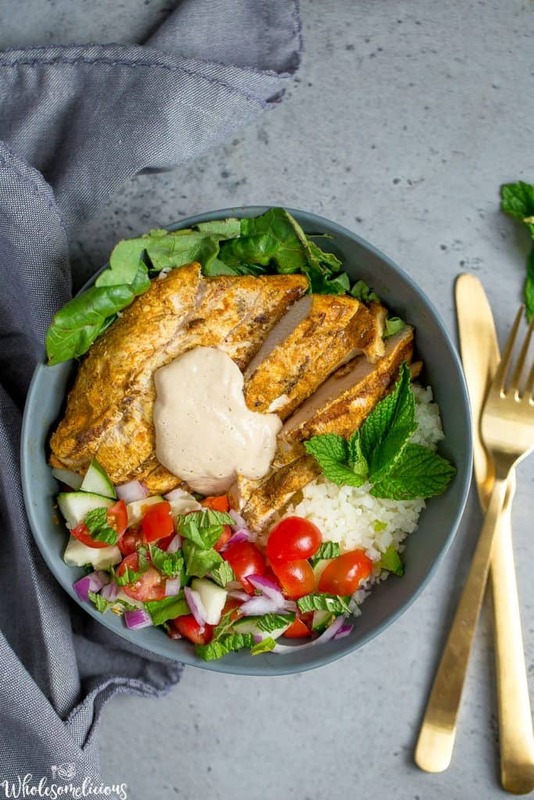 Make the tahini dressing: In a food processor or blender, blend your dressing ingredients: lemon juice, vinegar, tahini, coconut aminos, oil, garlic, cumin, and water. If dressing is too thick, add in additional water. Prepare your bowls: Chop the cauliflower into florets and place inside a blender or food processor. Pulse until cauliflower forms a rice-like texture, careful not to over pulse. 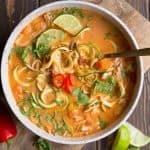 In a separate bowl, mix together tomatoes, cucumber, onion, and mint. Top with a pinch of salt and pepper. Layer the bowls by adding in romaine lettuce, cauliflower rice, and then chicken. Now top with the tomato mixture, and finally drizzle with tahini dressing. 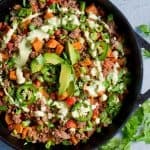 *You can also use pre made cauliflower rice, about 3-4 cups.